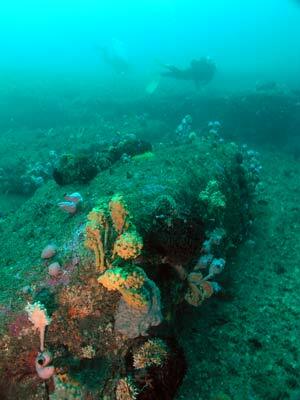 Michael McFadyen's Scuba Diving - Minmi Trench There are many great dive sites in Sydney. Places like The Split/Barrens Hut and Pizza Reef off Royal National Park, The Appartments off Long Reef and Shiprock in Port Hacking are but a few. In Tom Byron's most recent edition of his Southern NSW book, he wrote about a dive site on the northern headland of Botany Bay called Minmi Trench. 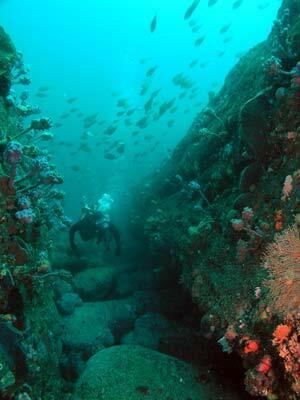 This is another of those great Sydney dive sites. I first attempted to dive this site a number of years ago after I purchased a copy of the book. However, the marks in the book that Mr Byron claimed would find the wreck did not line up. The marks were there, but they did not intersect, thus meaning the dive site could not be located. Many other prominent divers also tried to find the site but were unsuccessful. In mid-2004, some divers from Port Hacking Dive Club told me they had dived the site and that it was great. They had a new set of marks from a CD that was now accompanying Mr Byron's book. It apparently contains corrections and updates to the book. The inner northern headland of Botany Bay, Sydney's second major metropolitan waterway, is Henry Head. The outer headland of the bay is Cape Banks. There is a distance of just over 1,000 metres between these points. On Cape Banks is the wreck of the SS Minmi which sank on 13 May 1937. This wreck gave its name to this dive site. In late June 2004 I took my boat to find this site and using the new marks, we quickly found the location. From Botany Bay, travel past Henry Head towards Cape Banks and head to the GPS mark for the anchoring spot of 34° 00' 21.7"S 151° 14' 41.7"E (note that all my GPS Readings are using AUS66 - if you use any other datum, oyou will need to convert the reading - see my GPS Page for more details). To the south west you will notice a very large green water tank at Kurnell and a strange looking tower that we call the Golf Tee. Line the tee up just to the left of the water tank's left side (touching it) and run to the north west. Looking to the west past Henry Head and Bare Island you will see a number of fuel tanks at Port Botany. Run till the second one from the left just touches Henry Head. At this moment your depth sounder should show the reef jumping from 25 metres to about 20 and then 16 metres. Anchor on top of the reef. This should put you in the vicinity of the most interesting parts of this site. As you can guess by the name of this dive site, the main feature is a trench or gully (or more correctly, a series of trenches). The anchor should be pretty close to the north-western end of the main trench. I have explored this site using a scooter for about nine minutes to the south and about six minutes to the north. This covers a section of the reef for about over 500 metres. 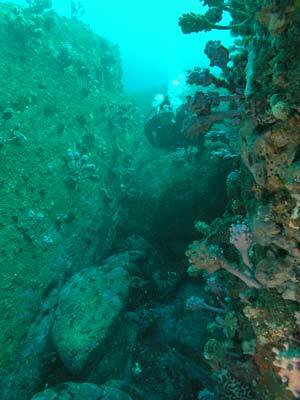 The site consists of a flatish reef at about 16 metres which drops off to 22 to 23 metres. Off the wall there are some small to large boulders. The larger boulders in some spots form a trench between them and the wall. This is a couple of metres wide and about four metres deep. The wall runs basically north-west to south-east but it winds about a little as it goes. South of the anchor you will encounter most of the trenches. As you go, there are numerous swim-throughs, overhangs and small caves to explore. A number of these have eastern blue devilfish resident in them. After a hundred metres or so the trenches end and there are a series of smaller boulders off the wall. The wall heads south here for at least a short distance. All along this section there is a huge amount of coal on the sand and in between the boulders. This presumably comes from the SS Minmi or even the wreck of the SS Woniora which is located about 2.5 kilometres south-east in the middle of the channel leading into Botany Bay. The depth on the sand to the south gets to 26 metres (but not 30 metres as shown on Mr Byron's CD). The reef top here is deeper than near the anchor (say about 20 metres). The wall is less prominent. Return back along the sand to the anchor area. If you have bottom time and air left, head to the north-west. 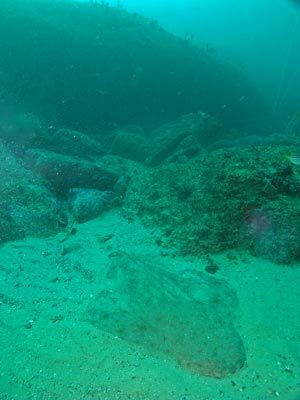 About 40 metres north of the anchor spot there is a very large low cave that is sometimes home to Port Jackson sharks. The wall past here is a little less prominent and the sand about 20 metres deep. Again, the reef edge winds around a bit. All along this section of reef there is great sponge life, all manner of colours. Reds, blues, greens, yellows and whites. There are sea squirts all over, also of many different colours as well as lots of small gorgonias. Fishlife is also prolific, with large schools of silver sweep and yellowtail. There are also lots of black reef and mosaic leatherjackets, cuttlefish, octopus and all the usual Sydney fishlife. One drawback of this dive site is that as it is at the entrance to Botany Bay, it is subject to possible poor visibility. However, if you dive on high or incoming tide you should get reasonable visibility. On my dives here we have had from 12 to over 20 metres. This is a site that needs quite a few dives to properly explore, even using a scooter. A truely great dive site. Unfortunately, currently there are no charter boats that dive this location as far as I know.